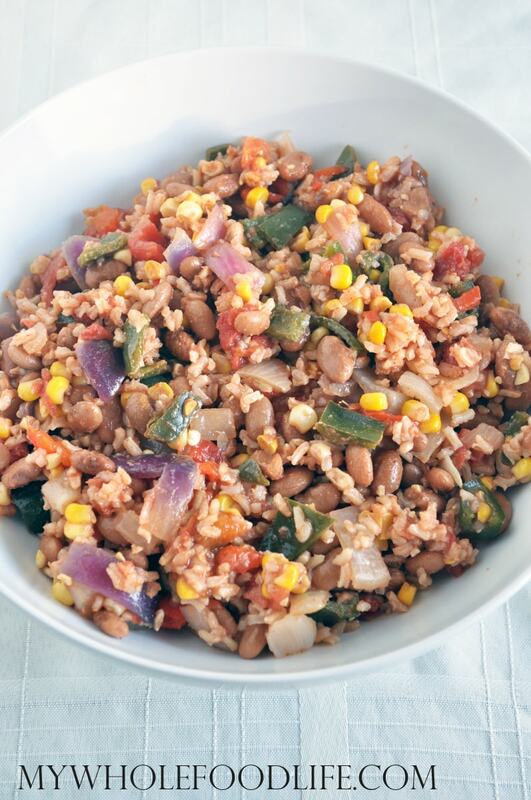 Mexican Rice that is vegan and gluten free. My husband is the spicy food lover in this family. This Mexican Rice is his recipe. He made it the other day when he was trying to use up all the food in the fridge. That first time he didn’t measure anything. It was so good that he had to re-create it with measurements so he could share it with all of you. Some of his other recipe creations are the Peanut Noodle Stir Fry and the Sweet Potato Chili. Also the Pumpkin Enchiladas. I hope you enjoy this recipe. This recipe is easy to make. A dinner ready in under 30 minutes. Vegan and gluten free. I also think it would work well with quinoa. Saute peppers, onions, and garlic 3 to 5 minutes on medium high in a teaspoon of oil. As they begin to soften, add the tomatoes and beans and let simmer on medium low for 5 to 7 minutes. Add the spices and rice and reduce heat to low and let simmer for another 5 minutes and remove from heat. This should last a week in the fridge. Enjoy. Just took a Mexican cooking class and the tip I learned is they always brown the rice first then add ingredients to rice. It was the secret I was missing to taste. so, so true Amy. Thanks for the reminder! It looks so good!!! Your is one of my favorite blogs and I've made so many of your recipes. Always easy and so good. I have noticed that I am not getting email updates anymore. Is there some kind of problem? Thanks Vanessa! No problem with my email service. Maybe they are going into your spam folder? Hello...no they're not. Any suggestions on what I could do? I'm still not getting your recipes. Can you send me an email with the email you registered with? I can look into if for you. melissa@mywholefoodlife.com Thanks!